Though we know God has called us to forgive others, we find ourselves asking: What if it hurts too much to forgive? What if the other person isn't sorry? 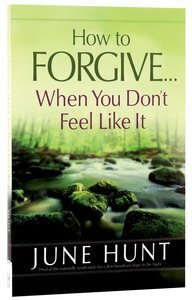 Counsellor June Hunt offers the wisdom of Scripture and experience to help readers find true freedom through forgiveness. About "How to Forgive...When You Don't Feel Like It"
What if it hurts too much to forgive? What if the other person isn't sorry? How can I let someone off the hook for doing something so wrong? Biblical counselor June Hunt has been there herself, enabling her to speak from experience as she offers biblical help and hope with heartfelt compassion. If you've been pinned down under a landslide of pain, here's how to find true freedom through forgiveness.